Do you have any students who struggle with feeling shy or uncomfortable in social settings? Have you noticed those children who don’t seem to know how to respond to comments from peers and just stand there in awkward silence? For some kids, this can lead to difficulty forming friendships and as they grow up, social anxiety. What if we could intervene at a younger age to help guide and coach them on conversational skills and friendship building? 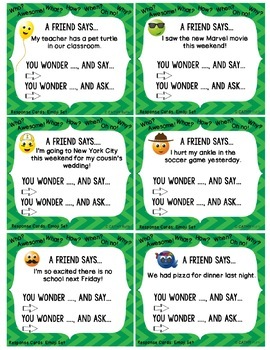 The 30 emoji-themed cards in this set feature a wide variety of common topics that come up often between friends such as weekend activities, recent movies seen, food recently eaten and what to do when bored. 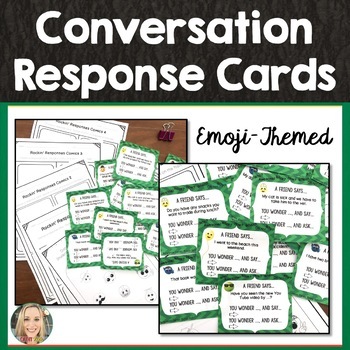 This resource comes with detailed tips for use, guiding you to teach the difference between a response and a follow up question. A response is the first reaction given to a comment. For example, if a friend says, “I went to the beach on Saturday,” a response might be “Awesome!” or “That’s cool! I’m so jealous!”. The response connects the listener emotionally to the topic and shows the speaker that he/she has been heard. The follow-up question maintains the conversation by prompting more information and details. “Who did you go with?” ”What beach did you go to?” ”Were there waves?” etc. all generate continuing discussion. 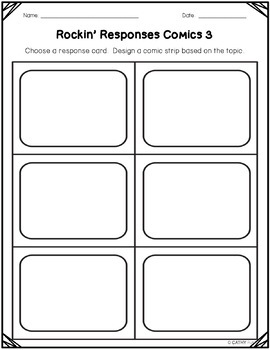 In addition to practicing in small groups or one-on-one, this resource includes 4 different comic strip template worksheets for students to visually process through an imagined conversations, based on the questions on the cards. Comic strip speech bubbles and emoji character templates are included, for tracing or cut and paste. 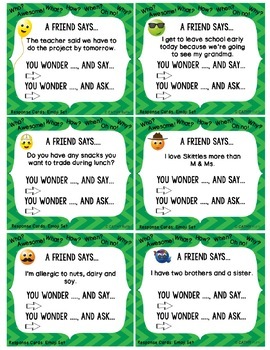 These would also be a great addition to an English Language Learners classroom. For this resource, I'd love you to leave me comments and feedback! I really appreciate it! After you download, click on the My Purchases tab. Then, click the green text "leave feedback". With every piece of feedback you write, you'll earn points towards free TpT resources! Also, follow my store and you'll be the first to know about new products, updates, and freebies! All material in this resource is for one classroom teacher. No individual pages can be copied or distributed to another classroom, or used in the creation of other resources. Additional licenses can be purchased for 50% off the original price by going to your purchases and selecting 'Purchase Additional License". If you are less than 100% satisfied with your purchase, please leave me a message through the “Ask a Question” tab in my store.